The couriers below are familiar with our beds and have proven to be reliable. We recommend that you email them for quotes and mutually agreeable delivery times. SHIPLY: https://www.shiply.com - For best prices be flexible with delivery dates and be prepared to wait for the best quotes. ANYVAN: https://www.anyvan.com - For instant quotes. Whichever courier you choose, always ensure that they have adequate insurance and are using a vehicle that can accommodate mattresses without bending or crushing them. Courier collections are from our workshops at 9 Yorkton Street E2 8NH (020 7729 9448), which are located about 150 metres from the Hackney Road showrooms. Pull the bell cord at Unit 9 to gain entry. Weekdays: 9.00 a.m. - 1.00 p.m., and 2.00 p.m. until 5.45 p.m. Saturdays: 9.30 a.m. until 12.45 p.m. There are no collections on Sundays when the workshops are closed. All couriers are independent. We neither take payment for, nor profit from deliveries. Collections are from our workshops at 9 Yorkton Street E2 8NH (020 7729 9448), located about 200 yards from the Hackney Road showrooms - see map. Pull the bell cord at Unit 9 to gain entry. Weekdays: 9:00 a.m. - 1.00 p.m., and 2.00 p.m. - 5.45p.m. Saturdays: 9:30 a.m. until 12:45 p.m.
Mattresses must not be folded. They have a light protective plastic wrapping and can be tied onto your car roof by our staff (not advisable with larger pocket spring mattresses). A roof rack is not required. Unassembled beds usually fit inside family saloon cars unless carrying passengers in rear seats. Larger beds, or beds with high headboards and/or drawers may require a van. Please note: Loading assistance given by our staff and the subsequent carriage from our workshops, is at the customer’s own risk. Saturday deliveries. We arrange deliveries within Greater London with a trusted independent carrier. These are reasonably priced and charged according to postcode and goods carried. We do not take payment for this. The driver is paid by the customer. Delivery charges and terms can be found here. Routes are planned a day in advance. Customers calling in after midday on the previous day are given a two hour delivery window. You may have to wait in if unexpected delays are encountered. The driver will endeavour to keep you informed. The driver will assemble beds for an extra charge (£15 for most beds). Pre booking and nearby parking is essential. That said, our beds are not difficult to assemble. An assembly kit with full instructions and telephone assistance is provided. 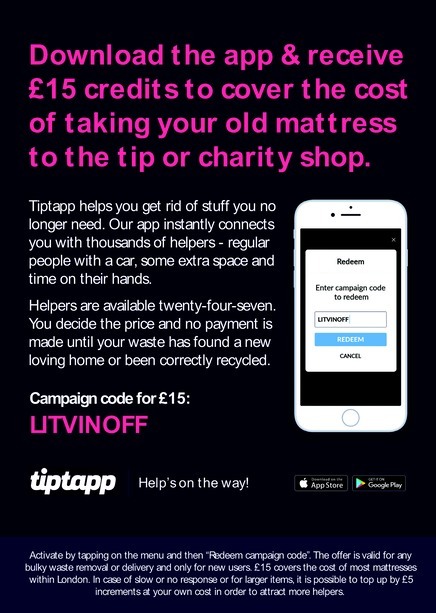 Customers in the London area can take advantage of a promotion by ‘TIPTAPP’ who will pay the £15 that usually covers the cost of taking a mattress to a local recycling centre, to a local charity, or to a designated address through their network of drivers. For additional items, it may be necessary to top up in £5 increments. This is a one off offer and is normally chargeable. More information. Local authorities are obliged to collect and dispose of ratepayers unwanted household furniture. Some recycling companies may be cheaper than the higher charging boroughs. 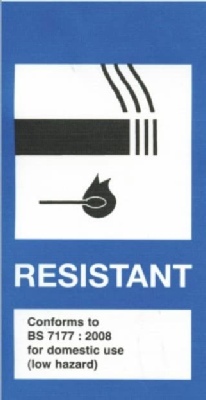 Many charities collect beds and mattresses bearing the statutory fire label and in good condition.